Memes are becoming new playful viral pieces on the Internet as more and more marketers are leveraging them for a rolling marketing culture, especially on social media. Memes are an act of thought that spread ideas, clues or some viewpoint from person to person. Memes carry a range of meanings that people derive from them, laugh at them and share them with their friends. In the online world, memes are used to encourage communication as they spread rapidly, and gain popularity within a short time. 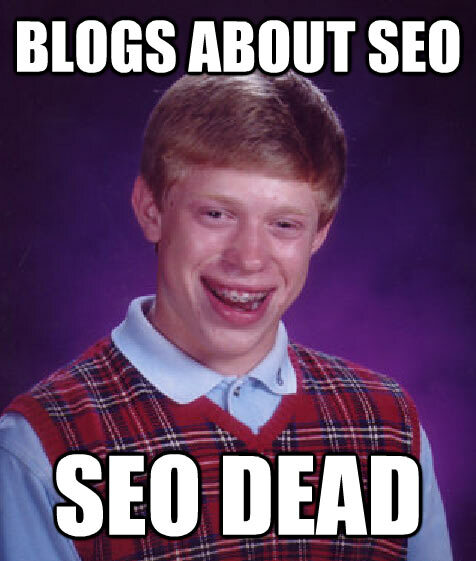 In this post, we will learn about how memes can play an energetic role in the marketing world. Let’s start. Memes carry a (hidden) meaning, reflecting on the current environment or popular culture. Memes invoke humor or express satire in addition to the original message. Memes stay relevant to the current trends and audience interests. Memes have a brief lifecycle. Memes can be a great marketing tool. What are Memes doing on the Web? The reason why memes get so easily popular is that they are image-based. People find them instantly familiar because memes remind them of something already known or easily recognizable. Below are reasons why memes become an immediate tool for sharing on social media. Memes relate to real life situations. Memes are a lot of fun all along the way. Memes are trendy and viral, therefore conducive to sharing. Memes serve as an advertising tool. For example: You can select your own image and a phrase on Meme Generator to create your meme. It is simple and free. You can create a meme of your choice and say what you want to via your meme. Below are some memes created by online meme generator tools. Like we humans, memes have a limited lifecycle. Their short-term Lifecycle reflects on the trending issue or culture. You should learn to use the right image at the right time. Below are explained three stages of a meme Lifecycle. Genesis: This is the first stage of a meme Lifecycle. The audience has never seen or heard previously about this newly born creative meme. That means, it is going to get much attention from its viewers. 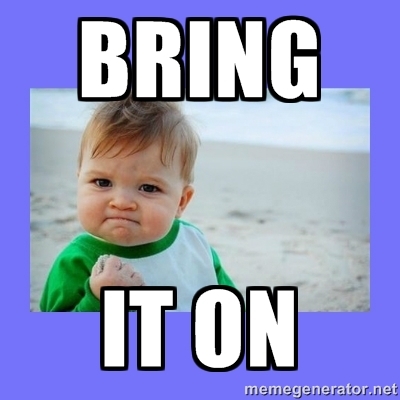 The Rise: This is the time when your meme is most shared on Facebook Newsfeeds, Twitter Retweets or other media. This is also the time when your friends or competitors are thinking to rephrase or recycle it, and use it for their own benefit. Still, you have the reason to smile as you are the original creator of it. The Time Up: Time to say bye and think fresh! This is when you can probably call your meme out-of-date or stale. 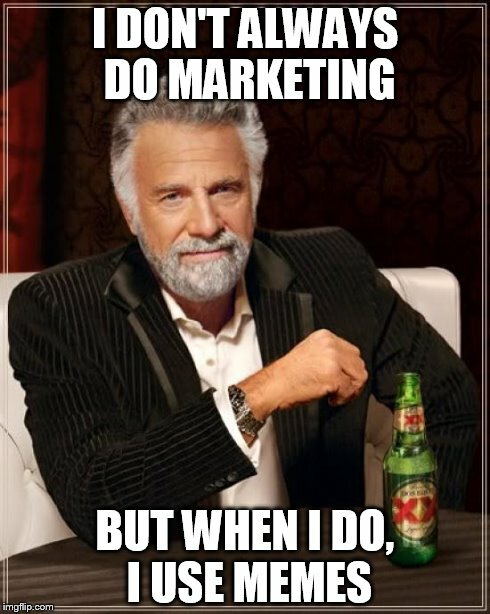 Marketing with memes is known as Memetic Marketing. Memes are created – understanding latest trends and popular culture – to market or advertise products and services. Many marketing, advertising and PR professionals are using memes to generate audience interest and get popularity through them. Here are some reasons why memes are so popular and used for marketing. They are peppy, fun and completely free. They have a stunning visual delivery to the Internet audience. They generate immediate reaction among the audience, and may become an overnight sensation. Since the audience gets to understand them immediately, there is no need to provide context to the image. There is an ease of sharing on social media or other networks. They are customized in nature and therefore likely to go viral easily on the Internet. It is a refreshing way to engage your audience. They take Internet culture by storm. If you plan to use memes for marketing your brand, you should know which memes are trending at that point of time. You can check social platforms and find out about the latest ones. Know Your Meme and Reddit are good sites to tell you about trending memes. It is good to involve humor, add the fun part while creating a meme. You should know how to present your brand in a comic meme. Make it humorous for your audience to find it instantly engaging. Use your brand’s unique variation in creating your meme. 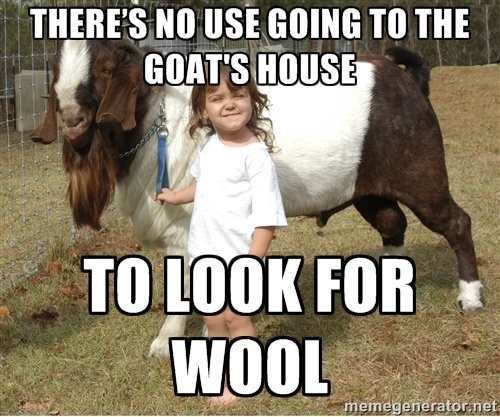 Suppose you own a wool company, why not use a picture of a goat and a baby girl along with a caption saying: There’s no use going to the goat’s house to look for wool (check above meme image). Create several memes and select the best one. Share it as much as you can, via emails or on social media. Ask your audience for their valuable feedback. This will help you in improving your memes further. So, I believe you are ready to become a hands-on meme creator now. You can choose any of the above discussed meme creator apps and make your own meme and amaze your audience. Give it the right punch with a good phrase and see the results. All the very best!!! Alan Smith is an avid tech blogger with vast experience in various IT domains, currently associated with SPINX Inc., a Los Angeles based Web Design & development company. You can follow Alan on Twitter. Nicely done, Alan. I learned a new phrase: “memetic marketing.” I have noticed that serious memes or memes that evoke emotion seem to be getting more popular. Some of these, for example http://imgur.com/bestof2014. Thanks for your comments and liking the phrase: Memetic marketing. You are right, memes are such catchphrases and spread so fast from one individual to another that they stand perfect for viral marketing. The examples are great on Imgur.